This illustrated lecture by historian Victoria Johnson features her acclaimed new book, American Eden (Liveright/W. W. Norton, 2018) which is long listed for the 2018 National Book Award in Nonfiction. When Alexander Hamilton and Aaron Burr met on a dueling ground in July 1804, they chose the same attending physician: David Hosack. Family doctor and friend to both Hamilton and Burr, Hosack is today a shadowy figure at the edge of a famous duel, the great achievements of his life forgotten. 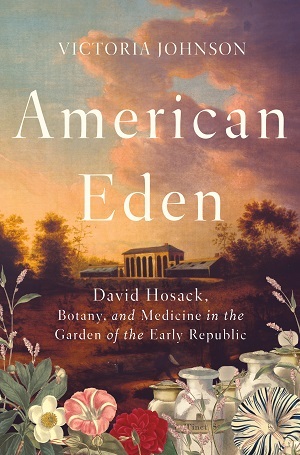 But in 1801, on twenty acres of Manhattan farmland, Hosack founded the first botanical garden in the new nation, amassing a spectacular collection of medicinal, agricultural, and ornamental plants that brought him worldwide praise from the likes of Thomas Jefferson and Alexander von Humboldt. Hosack used his pioneering institution to train the next generation of American doctors and naturalists and to conduct some of the first pharmaceutical research in the United States. Today, his former garden is home to Rockefeller Center. The New York Times writes, “Hosack’s Columbia lectures were . . . ‘as good as the theater,’ and so is Johnson’s storytelling.” Book sales and signing to follow.